The Oster Versa 1400 is a high powered blender that can be considered the competition of Blendtec and Vitamix. 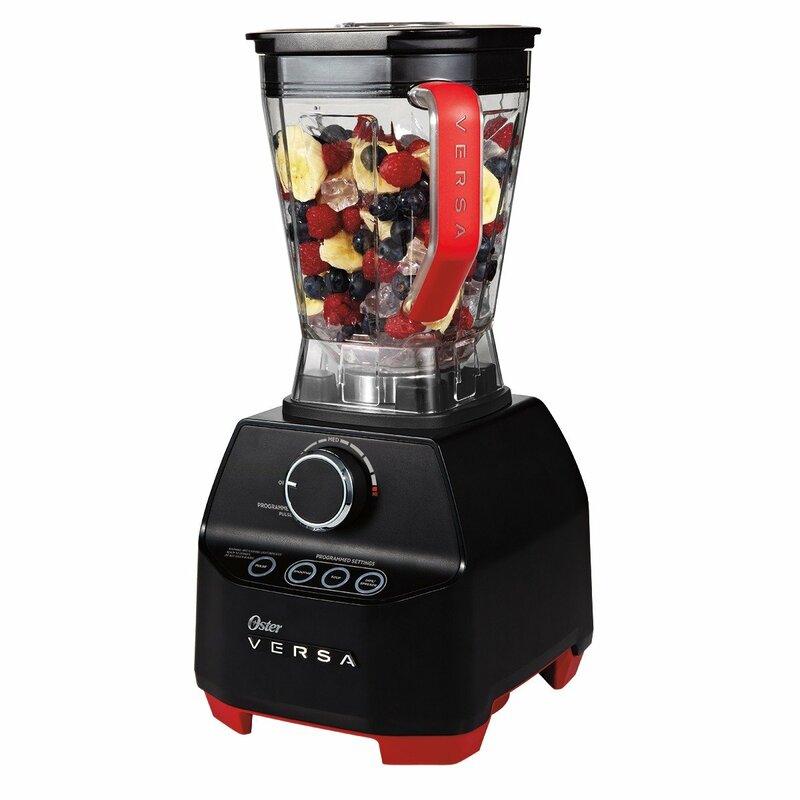 The Oster Versa 1400 is quite a large blender and it does occupy a bit of counter space. The Versa comes with the option of two different jars: one shorter which could fit under your countertop and one slimmer and taller. The capacity of both jars are the same/ Only the design and color change. Some people classify the blender as elegant and sleek. I suppose it depends on personal taste, but I would not say that. But the short jar has a red handle that matches the blender legs. This blender can be used to prepare smoothies, shakes, juices, crushing ice, dips, soups and processing nut milks or nut butters. 2 color books with recipes. When choosing a blender it is good to know what budget you have and also what you want the blender for. Reading all the reviews I realize that this blender is excellent for some people and it can be quite bad to others. The point is that those people have different expectations. 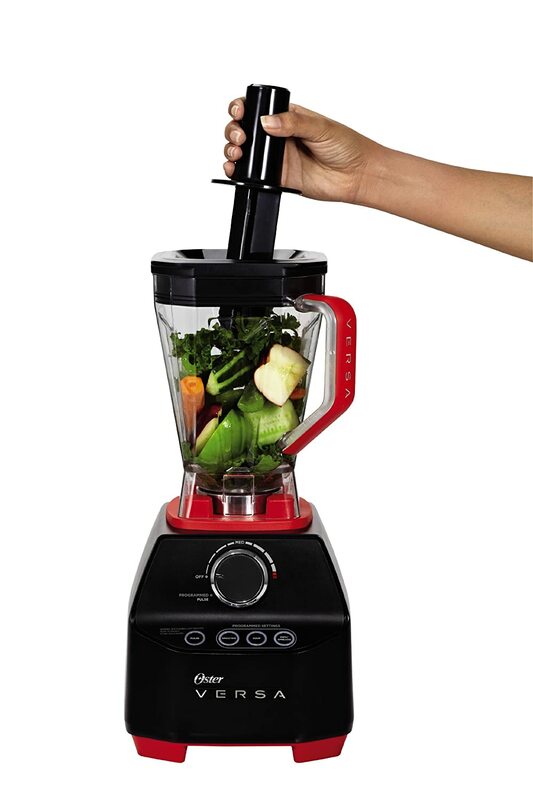 As you may have guessed, this is a countertop high powered blender. It is quite versatile and it can replace several appliances in your home. The unit will process from fruit to vegetables, to ice, to nuts and grains. It is good to prepare smoothies, sorbets, shakes, juices, blend hot soups, dips and spreads. 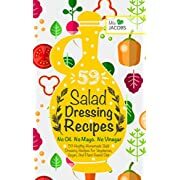 Though it can makes lots of things, it is not really designed to work as a food processor, so it will not slice or dice vegetables. When it comes to soup, it is best just to use it to blend the hot soup. If you want to prepare soup with cold vegetables, it will warm it, but it will not be boiling hot. The Oster Versa 1400 is strong enough to process the core of an apple, though it is not recommended to eat the core of an apple as the seeds contain arsenic. When compared to the Vitamix, and Blendtec, the Oster Versa performs quite well. Sometimes it might not blend as smoothly as them in the same amount of time. But if you leave it running for a bit longer it can achieve the same consistency. This blender has an all metal drive, which makes it durable. It also has two sensors an overheating sensor and an overloading sensor. If you run the unit for too long the unit will switch itself off. This is to avoid overheating. It will look like it has died If you turn the dial to pulse mode, the light will not glow. . Once it has cooled down it will work again. The overloading sensor indicates you have loaded too much in the jar. Remove some of the contents. If you turn the dial to pulse mode the light will glow, the unit will be ready to go, but it will not work until you remove some of the contents. This unit , comes with a tamper same as the Vitamix. There was a problem with the tamper for the first batch of blenders. The tamper was too long and would touch the blades. I believe the problem was with the lid that didn’t stop the tamper at certain level. This seems to have been resolved, but if you have a problem still I suggest to contact the manufacturer. Overall this unit can do everything the Vitamix or Blendtec can do, at a quarter of the price. 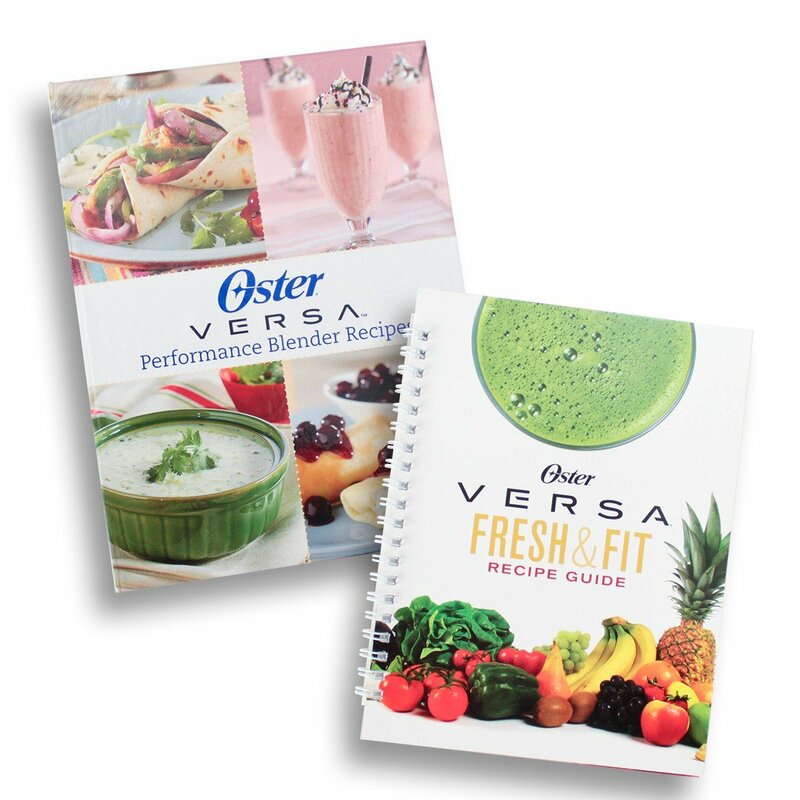 There are two models of the Oster Versa. One comes with a shorter jar, and the other one comes with a narrower but longer jar. Both jars have a capacity of 64 oz. Both jars are made of a BPA Tristan plastic and they come with a no-mess spout. Though they have measurements on the jar, they are not easily visible. The shorter jar is wider and it comes with a red handle which matches the leg of the blender. The handle is hollow. The unit that comes with the taller jar is all black and the jar has a clear handle. Both units jar lid come with an ingredients cup and a tamper to help the blending process, similarly to the Vitamix. With the Tamper you can push around the ingredients whilst blending. This will help to process then. You do not always need to use the tamper, only when you feel the blender needs a bit of help. The shorter jar will most probably fit between the countertop and the hanging kitchen cupboards. The taller jar will not fit. The blender has a jar sensor. This sensor indicates that the pitcher is sitting properly on the base. If it is not, then the unit will not work. The control knob must be in the off position when placing the jar on the base. There are some questions about if the Oster is compatible with the Vitamix jars. They are not. They only compatible with Oster jars and accessories. The shorter pitcher seems to be more popular than the taller. It is easier to handle and to clean. 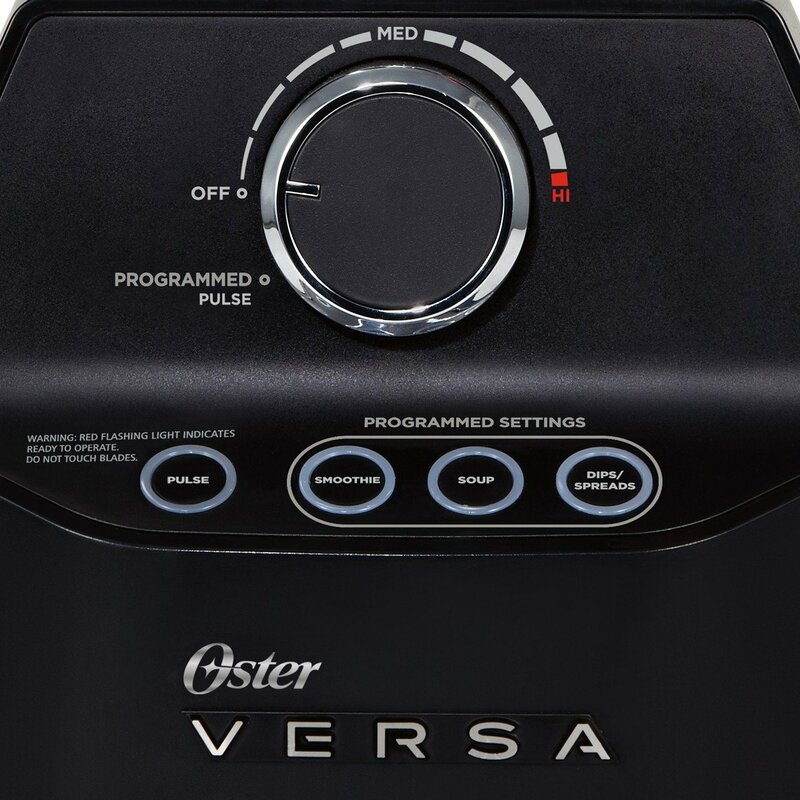 The Oster Versa comes with a powerful motor of 1400 watts. The motor has the same power as some of the Vitamix models. The RPM is 28000. The Horsepower is 1.7. The motor has an overheating sensor. If you run the blender for too long it will switch off until it cools down. The unit will look as dead, and no light will be blinking. 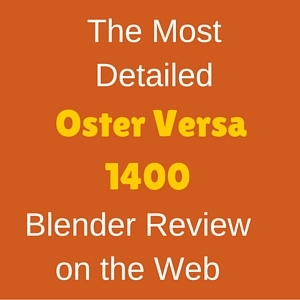 The Oster Versa 1400 has an all metal drive. This means that the connection between the jar and the base is metal, which makes it more durable. The Oster Versa 1400 comes with 3 programmes, and a manual dial speed. When using the manual dial speed, just turn the knob clockwise to the desired speed, from Low to High. The programmes available are for: smoothies, soups and dips/spreads. The program will run for a specific time and then it will stop . To use the program you need to turn the knob counter-clockwise to the programme and pulse setting. The pulse light will flash indicating the unit is ready for operation. Then press the desired programme. The unit will stop when the programme has finished. The buttons are not sealed. So if liquid falls on the buttons it might penetrate and go under the button. The Oster Versa blades are different than the normal blades. They are stainless steel blades, and it has four prongs on the base, and then it has two smaller prongs over the other four prongs. It is like a smaller blade on top of the bigger blade. The jar, lid and filler cup are not dishwasher safe. I suppose the tamper is also not dishwasher safe. But the blender is very easy to clean. To clean fill the jar halfway with warm water. Add two drops of dishwashing liquid. Set the jar on base, and blend for 30 to 60 seconds. Start with the speed dial on low and increase it to high. Then rinse jar and you will have a clean jar again. You can clean the the base with a dump cloth. There are no food processor attachment available for the Oster Versa 1400. This blender is only compatible with the Oster Versa Jar accessories and Jar. The Blend N’ Go cups are not compatible with the Versa Oster 1400. They are only compatible with the Versa Oster 1100 model. This blender comes with two color cookbooks with recipes. Short Jar :All I could find here is the people comments on this. They are talking about a height of 18 ½ in. The unit has a cord storage. It comes with a limited 7 years warranty. Short container can fit under cupboards and in cupboards easier. Safety feature sensor to determine when jar is on. It is loud (all blenders are). It is too big so storage could be inconvenient. Minimum volume to operate efficiently is 2 cups . This blender has a rating of 4.3 in Amazon and I would agree with it. It is a good blender comparable with the Vitamix and Blendtec. It is possible that it does not always perform as the higher end blenders, but you are also getting this unit at less than half the price of the higher units. Many people were happy with the performance of this blender, and they are happy to save some money. Some people have had bad experiences, and they said the unit does not blend frozen fruit properly, or that you need to pre-chop vegetables so that the unit does not overheat. 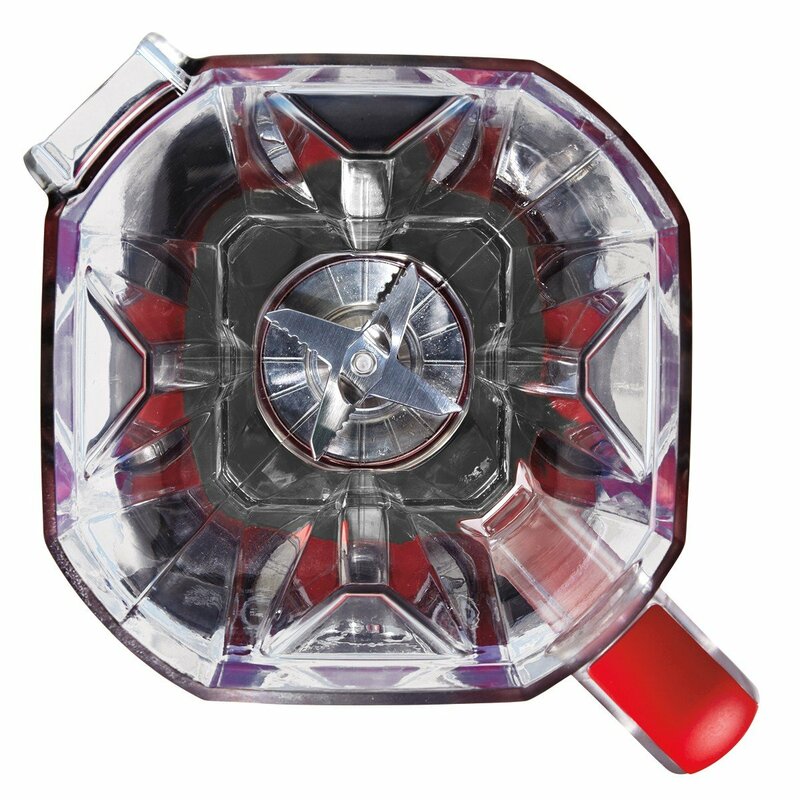 Other people thought this blender was difficult to operate. But for majority of reviews said this blender was a very good buy. It also depends on the expectations you had of a blender and what you will use it for. This is perfectly fine for a home use blender . You also get the 7 year guarantee from the manufacturer. The good thing about this blender is that is almost as good as the higher end blenders but at a much cheaper price. So if you were wanting a high performing unit and you did not want to spend all that money perhaps this is the unit for you. Based on the reviews I researched this is a powerful blender. 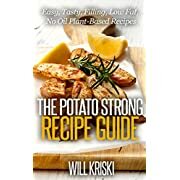 If you were thinking of purchasing a high end blender like the Vitamix or Blendtec and you were put off because of the price, I would try this option. Like I always say, it depends on your priorities. If you have the money to spend then great you can always go for the Vitamix or Blendtec. But if budget was a concern and you still want a high end blender, I think this would be a great option. Another point to remember is that people tend to buy always the best just in case, and perhaps we never get to use all the features. So just because it is not the best blender in the market, it does not mean that it would not be useful to you. As always there are other options available, if you still think this blender is out of your budget. If you prefer smaller blenders I would also go with the Ninja Professional Blender or the KitchenAid Diamond Blender. Thank you for visiting my site. I just spoke to Ninja itself and they told me there is no difference. The only difference I found is the design of the base. The BL740 is a little bit wider and the pitcher a bit shorter (but same capacity). I could not find any other difference. They both have the locking lid. I hope this helps. It is confusing. Of all the things that I have spent good money on the item that I have been most satisfied with is the Vita-Mix blender. I am surprised it wasn’t in your reviews. Hi James, Thank you. 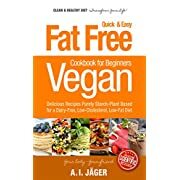 Yes I am still busy with reviews, and I know I still need to do the Vitamix ones. THanks.